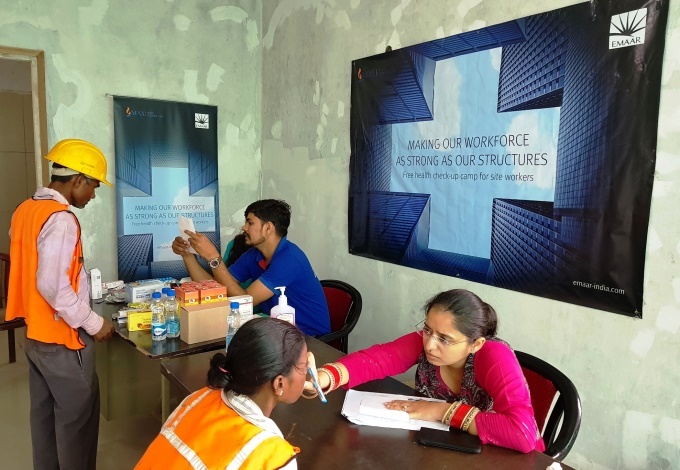 Emaar India, a leading global property developer, recently organised a free Health Care Check-up Camp for its construction workers at its Emerald Hills project in Sectors 62-65 on Golf Course Extension Road in Gurugram, Haryana. The healthcare camp was organised by Emaar India’s philanthropy arm Emaar Community of Aware and Responsible Employees (EMCARE) in association with Max India Foundation. A team of specialized Doctors from Max Hospital, Gurugram conducted general health examinations like blood pressure, blood sugar, joints and bones strength, nutrition and vitamins level. More than 150 construction labour force from Emerald Hills project site – around 80% of which were women and children – underwent health check-ups. Free medicines were also distributed to the site workers as part of the social welfare initiative. The doctors also held health awareness sessions which emphasised the importance of sanitation, hygiene, timely diagnosis and preventive measures to lead a healthy life. Under the aegis of its philosophy Welfare for All, EMCARE has partnered with Max India Foundation to organise a healthcare camp every month for the 15,000 construction workers employed at its project sites across India. Prior to this, Emaar India had organised a healthcare camp at its Imperial Gardens project on Dwarka Expressway, where more than 200 construction labour force workers benefitted from this social welfare initiative.